JOE MARINO grew up in the South Bay of Los Angeles and taught music in the Palos Verdes Peninsula area for over 33 years. Retiring after teaching music at Peninsula High School for 14 years and at Ridgecrest Intermediate for 19 years, he provided instruction to students in symphonic orchestra, chamber orchestra and jazz band. 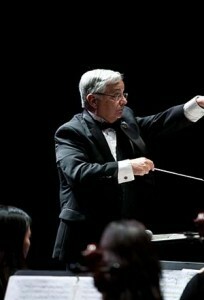 Mr. Marino was also conductor of the Los Angeles County Southwest Youth Symphony for 16 years, and conducted musical productions at EI Camino College as well as for the cities of Redondo Beach and Hawthorne. In 1993 and 1998, JBA and Hino Motors chose him respectively to visit schools in Japan as part of an educational and cultural exchange program. A member of the Los Angeles Master Chorale for 4 years, he attended California State University, Los Angeles where he received his Bachelor of Arts degree in Music and a Masters of Arts degree in Musicology.